Mayor Rahm Emanuel on Tuesday promised that work would start on redoing the Cottage Grove Green Line station by the first half of next year. WOODLAWN — Mayor Rahm Emanuel on Tuesday announced he was pushing forward with a plan to redo the Cottage Grove Green Line stop and promised work would start early next year. Emanuel said work would start to redo the southeastern terminus of the Green Line in the first half of 2018 at a lunch Tuesday afternoon with Woodlawn community leaders at Metrosquash, 6100 S. Cottage Grove Ave.
Emanuel originally announced the updates to the train stop in April, but there was no funding attached to the project at the time and it seemed uncertain when the project would actually start. The mayor is pushing forward with the plan, but gave no updates about how the project would be paid for. The CTA is working off concept designs drawn up for Preservation of Affordable Housing that were part of an effort by the nonprofit developer to get the city interested in investing more in public infrastructure in Woodlawn. Emanuel ran with those ideas in April and presented them as the foundation of the city’s own future designs. No updated plans for the train station were shown Tuesday. It was a return to Woodlawn for Emanuel after a spring of groundbreakings and project announcements in the neighborhood. On Tuesday he underlined a recent Redfin report that claimed rising property values in Woodlawn as a sign of an upswing for the neighborhood. “We’re just at the first stage of taking this to the next level,” Emanuel said. The report was greeted with skepticism that it may be a symptom of an unhealthy amount of property speculation around the Obama Presidential Center and may be a prelude to rising rents. 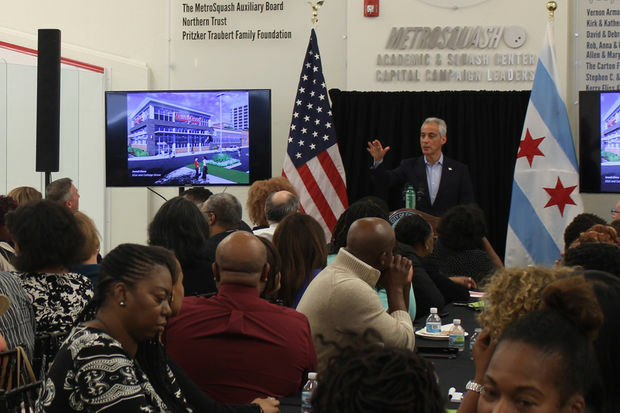 Emanuel said rising property values, along with improved test scores among Woodlawn students and new businesses opening, are a sign that the neighborhood is starting a new chapter. “If you want to know the future of Chicago, you have to know the future of Woodlawn,” Emanuel said.